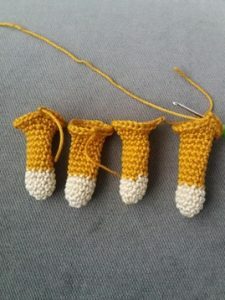 Fill the legs while you crochet along. It will be easier for you and the filling will be more even. Stuff well the legs. 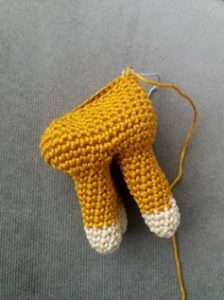 When we continue on body fill it as well as you crochet along . 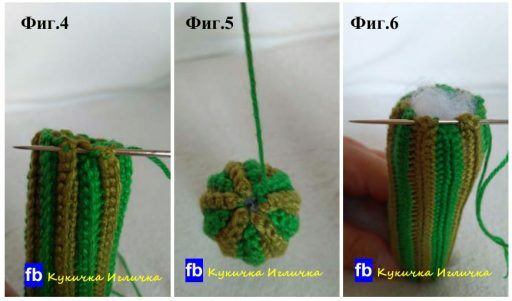 The pictures are with different color yarn, but you keep crocheting with the colors indicated on the written instructions. 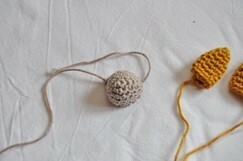 Safety eyes- 6mm or use crochet ones. We will work from outside of the feet. We have 24sc of each leg. Work around the 12 sc of outside, leaving the rest 12st from inner part which we will sew later. PM to indicate 1st st because if you loose a st the body will not be centered. 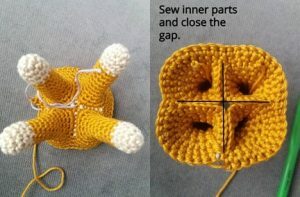 Insert your hook in any stitch of rnd 17 and pull a loop, ch 6, FPSC in next st, *ch 6, FPSC in next st * rep al around the rnd, then skip 1 rnd and go to 1 rnd above repeat the same process again. If your fur is too tightly you can skip 1 st between the ch 6. Repeat the fur all around the body and head. Sew muzzle in front of the head 3 rounds bellow ending. 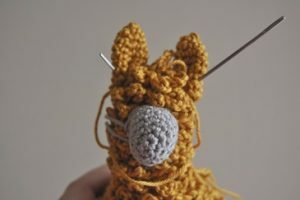 Sew ears on both sides of the head. You can pin them first to see if they are placed correctly. Fasten off. Sew tail on back. 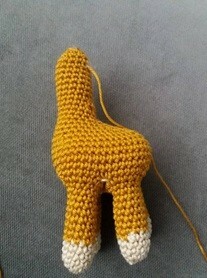 Place it centered above back legs. Use 2 different colors. Change color in every 2 rows. Start with green, then switch to blue and so on. 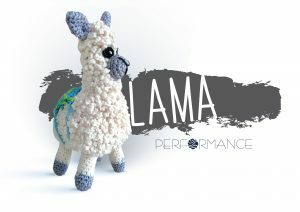 Now take green color yarn and put 1 sting of each corner so we can tie the blanket on our llama. 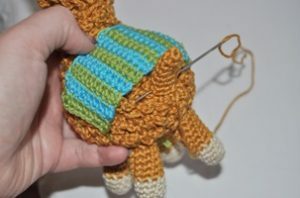 Use black color yarn and make MR, make 5sc into it, join with sl.st on top of 1st st. Sew eyes above the muzzle. Using black string to form the mouth. To make the eye’s expression deeper use white string and make white lines on the upper part of eye.